Make a splash with this handmade, exceptionally detailed mermaid bar tap handle. We have proof that mermaids really do exist – at least in beer tap handle form. This custom tap handle features the sculpture of a blonde mermaid relaxing on a wooden pier post. You are your guests will appreciate the whimsy and detail of this design. Made from plastic resin, the Mermaid Draft Beer Tap handle is sturdy and made to deliver worry-free pouring for years to come. 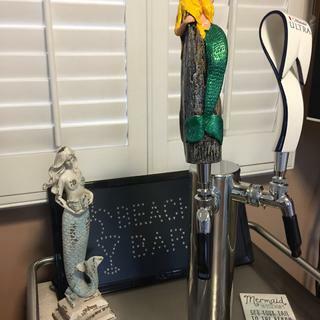 The Mermaid Draft Beer Tap Handle is perfect way to finish off your nautical- or beach-themed bar, or just as a fun conversation starter while you shell-abrate good times at your home or commercial bar. This novelty beer tap handle measures 9 inches tall and is designed to fit on any standard beer faucet. Its standard tap handle thread allows you to replace your old tap handle and/or install this mermaid bar tap handle very easily: just screw onto the faucet lever collar atop your draft faucet. It can be screwed on from the bottom of the unit so that the mermaid can face out toward the bargoers. That way she can be, "part of your world!" Please note: Tap Board tap handle seen in picture is not included. Quality product with longevity, not worried about falling apart or breaking. Appears handmade, very think enamel for longevity of product, not the most attractive face but it’s carved out of wood don’t have too high of standards. Looks great! Painted beautiful. Have received many compliments.